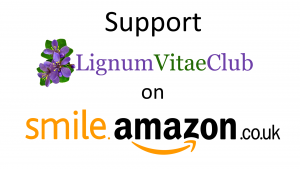 You can now support Lignum Vitae Club when you make purchases from Amazon via smile.amazon.co.uk. Simply go to smile.amazon.co.uk, select “Lignum Vitae Club” as the charity you want to support with your purchases and as long as you buy directly from smile.amazon.co.uk, a percentage of your purchase price will be donated to Lignum Vitae Club by Amazon with no extra cost to you. For more information, please see our post about Amazon Smile. We appreciate all monetary donations as in these tough times it’s the biggest thing other than your time to give. For details of how to donate via cheque to the Lignum Vitae Club please contact the Treasurer. You can donate to our charity by texting TLVC45 followed by the amount you wish to donate, to 70070. All the money you donate goes to us. These amounts are fixed by the JustTextGiving service and cannot be altered I’m afraid. If you wish to donate more, please feel free to send in multiple text messages equaling the amount you would like to donate. Note: Please be aware that you may be charged for your text message. Please refer to your network operator’s standard rates. If you have a monthly phone contract, the payment will be deducted from your bank account in the same transaction as your monthly bill. If you are on a Pay As You Go plan, the amount will usually be deducted from your Pay As You Go balance not your bank account. For those wishing to contribute to us via PayPal, you can either make a payment to info@lignumvitaeclub.org.uk or donate online. Throughout the year we hold social events and monthly meetings (members only) so you can catch up on the latest news and have your say on the future of the club. Unlike our meetings, our social events are for friends as well as members, bring along the whole family if you like. We understand that some people can’t commit their time so far ahead of schedule, so why not volunteer at an upcoming event. Every hand helps. When we have these types of events please feel free to contact us and sponsor one of our participants.